There is lots of instruction material on the web (see Resources) that can teach you how to play. Here is a quick summary to get started. Two players sit face to face with the Go board (right) an empty grid, between them. One player chooses black pieces, called stones, the other player takes white. In an even game, Black plays first. In a handicap game, Black begins with stones already on the board, and White makes the first move. Players take turns, placing one stone at a time on the intersections of the grid, called points. The object of the game is to use your stones to build walls that surround more points than your opponent. A wall is a contiguous string of stones that begins and ends at the edge or forms a loop in the center of the board. All stones on the board will have two, three or four grid lines extending from them. If the adjacent points are vacant the stone has one or more liberties (Black has 4 liberties in Fig 1). If the adjacent point is occupied by the same color the stones form a unit, string or group. If all the adjacent points of a stone or group of stones are occupied by your opponent’s stones, your stone or group of stones is said to be captured. 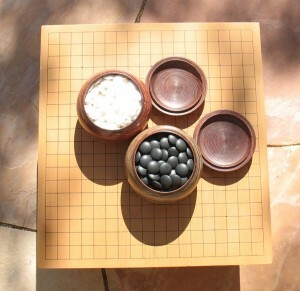 (White captures one black stone when white plays on A in Fig. 2.) Captured stones are removed from the board. Once played, stones do not move, unless they are captured. As a consequence of these rules you will discover that some stones are safe because they can never be captured, because they have surrounded two separate points, called eyes (A and B in Fig 4). Groups that have or can make two eyes are said to be alive. Stones or groups of stones that can be captured are said to be dead. Rarely, stones may also be alive in dual life or seki, when neither side has two eyes, yet neither side can capture the other. You may play on a point without liberties if you are capturing. Occasionally this may lead to a shape called ko where a single stone could be recaptured on each move and the game would continue indefinitely. The rule of ko allows the game to continue because it says that you may not immediately capture a stone that has just captured, until you have played somewhere else on the board first. The game is over when both sides pass. Players should only pass when no more points can be surrounded. In practice knowing when there are no more points to be surrounded and passing at the correct time is difficult. You may lose points by continuing to play, or lose the opportunity to make points by passing too early. Once both players have passed, count the number of surrounded points. Captures and dead stones count as an additional one point each. The player with more points is the winner.